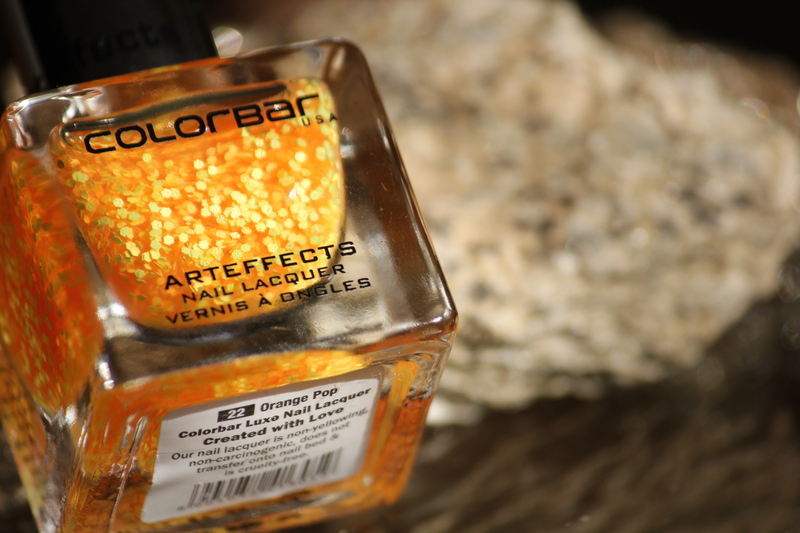 Colorbar Arteffects Nail Lacquer – Orange Pop (Rs 325 for 12 ml) is a transparent nail polish with a really happy orange-yellow shade of glitter particles. Without being too shiny, the focus is on the bright color of the particles instead. It takes just a wee bit longer to dry if you dab more particles – in case you want a deeper color concentration. The shade looks amazing on long and short nails. The first thing that attracted me to the bottle was the truly bright color! It is just right for spring. And the particles are non-glittery so the color pay off is quite reasonable. 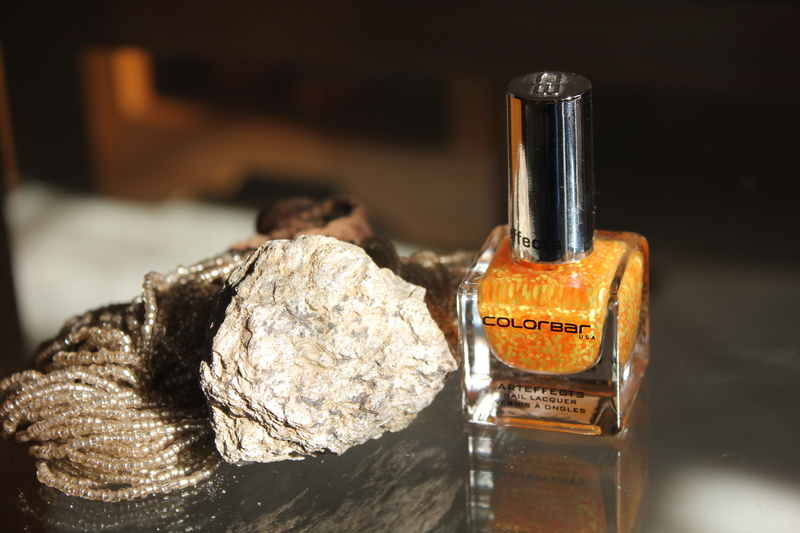 This shade is perfect for those who are chicken to try out a full yellow nail polish. 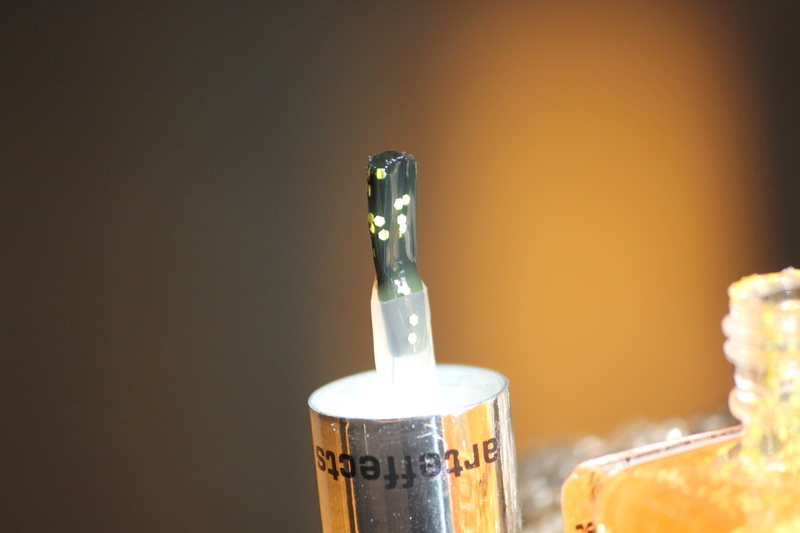 The brush of the nail lacquer is just so different! It does not fan out so much, but still has the width to be able to cover the nail in just about two strokes. It is round shaped and not flat and that means there is no streaking and the color particles spread out evenly giving the nails effortless end-to-end coverage. The nail lacquer is good on its own or for when you’re in the mood for some funky nail art. The lacquer stays on for almost a week – and maybe longer if you don’t wet your hands that often. For best results, always apply two coats. Apply the first coat as a thin layer, starting from the middle of the nail and then move to the sides. Let it dry completely. Apply the second coat and allow it to air dry. We are glad that you liked it! We will review some sunscreens soon!